Featuring a stellar cast and a robust spirit, Master and Commander: The Far Side of the World has moments of greatness, but this rip-roaring adventure could use a little more rip to match its roar. Captain “Lucky” Jack Aubrey (Russell Crowe, Gladiator) is a brilliant strategist and seaman, a captain who has the dedication and adoration of his crew aboard H.M.S. Surprise. With his trusted friend, Dr. Stephen Maturin (Paul Bettany, A Beautiful Mind), at his side, Aubrey leads his men into battle against a sleek and stealthy French ship, the Acheron. Outmanned, outgunned and unaccustomed to defeat, Aubrey finds himself caught between a sense of duty to the British Empire and his own pride. During the journey, the equivalent of hide-and-seek at sea, the crew endures everything from heat and dehydration to the freezing, snowy conditions of their southerly trek. It’s an epic quest that covers lots of ground, from seafaring legends and curses to the exhilaration of discovery. In 1805, the spirit of adventure is alive and well, but it is also a brutal place. Boys in their early teens are enlisted in the service of the British Empire and subjected to the horrors of war and life at sea. It’s a culture of honor and dignity that intermingles with hardship and suffering. Without their parents to fall back on, noble figures such as Aubrey and Maturin take the lads under their wing and help them make the leap from boyhood to manhood. Sometimes they’re successful, sometimes they’re not. In the early going, Midshipman Blakeney (13-year-old Max Pirkis making a terrific film debut) bravely faces amputation early-19th-century style after being wounded in combat against the Acheron. At the other end of the spectrum, Midshipman Hollom (Lee Ingleby, Borstal Boy), unable to earn the trust and friendship of the crew, has his own, more questionable — some would say cowardly — way of dealing with difficulties. Based on Patrick O’Brian’s series of historical novels involving Aubrey and Maturin, the film offers a bounty of material. The characters are well drawn and impeccably acted (Crowe and Bettany in particular are at the top of their game). There are also scenes of high adventure, quiet conversation, compelling drama, combat, natural beauty, and even music supplied by the string duet of Aubrey and Maturin. Basically, it’s a seafaring “slice of life” movie with a lot to admire, but it doesn’t quite coalesce into a wholly satisfying experience. Director and screenwriter Peter Weir (The Truman Show) clearly has David Lean-sized aspirations with the free-flowing, sometimes meandering, storyline and cinematographer Russell Boyd, who collaborated with Weir on Gallipoli and The Year of Living Dangerously, is up for the challenge of putting Weir’s vision on film. While Lean made his fame and fortune with lengthy epics set to their own pace, Master and Commander at times feels like a hodge-podge, as if Weir was trying to throw too much into the tempest. The end result is simply a lot of good pieces to mull over afterward, which is still an admirable accomplishment. Another facet that resonates with today’s unsettled world is the film’s ability to balance an appreciation for the excitement generated by Aubrey’s relentless pursuit of victory against Napoleon’s French forces with the British losses incurred along the way. Aubrey is indeed a great character, and the potential is there to wrap an entire film franchise around the legendary captain. Crowe easily fills the boots of this character. He’s the ultimate man’s man, dashing, honorable, smart, and strong, he’s also got a good sense of life and humor about him. In a way, that sentiment also sums up the film. It’s a little difficult to embrace entirely, but it also sticks in the mind. 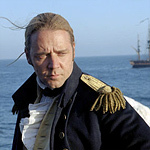 Its shortcomings aside, Master and Commander: The Far Side of the World is still a see-worthy movie.